Thank you guys for all your awesome questions! I tried to answer the most popular ones as best as I could bellow. If you asked me more specific editing questions, definitely shoot me a message and I can answer them a bit more personally! I'd also like to take a second to thank all my awesome followers and clients for being amazing to me. I appreciate every single one of you. Finding people so interested in my work and wanting to see me succeed is honestly one of the biggest reasons why I do what I do. I have clients that have been recommending me for years and coming back season after season to get new pictures and following my journey every step of the way. Just know that once you join this train, you're part of the Giana Terranova Photography family! I know I can't reach all of you with my work sometimes, but I hope to some day! Maybe one day I can finally cross every state off my map. 01. How did you get into photography? I probably tell story a lot, but here it goes! I was originally really into film, mostly editing videos of me riding, which fueled a lot of my Youtube days. However, when my parents booked me a Senior Session with my first horse Cooper, I was both very excited and extremely nervous. As far as I was concerned, I SUCKED at getting my picture taken. I've always wanted to be behind the camera, not in front. My mom hired an AMAZING photographer, her work was stunning and I loved her style. She actually made me feel so unbelievably comfortable in front of the camera, and they're probably some of the least-awkward pictures of me ever taken. My only critique was that my silly horse looked pretty awkward in a lot of the pictures. His mouth was always gaping open, ears pinned, etc. Not to her fault at all, she wasn't a horse person and just didn't know the things that drive us equestrian's insane! 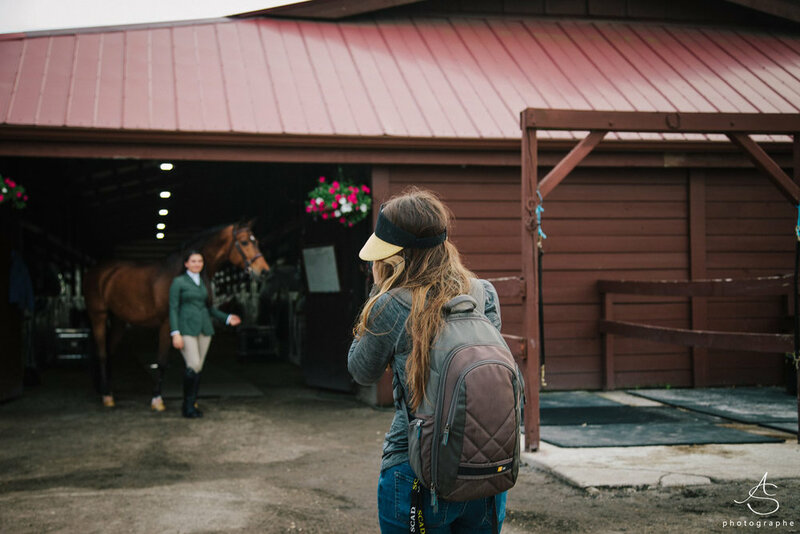 It sort of gave me an idea... what if I could combine that amazing photography skill and the ability to communicate with a client -- with horse knowledge! That kick started my business when I was just sixteen and haven't looked back since! My photoshoot with Cooper that started it all! He was the horse of a lifetime that really got me started in the world and taught me how to ride. He passed away this last year and I miss him dearly. 02. What kind of camera, lens, equipment do you use? Pretty much all my recent work this year I use my Nikon d810 and my Sigma ART 85 mm 1.4. I almost never take that lens off my camera! The only time I usually switch is for action shots and horse show photography, then I use my Nikon 70-200mm 2.8 FL. Every once and a while I'll also use my Sigma ART 35 mm 1.4, but never for horses as I find it distorts them too much. I usually use it for any film work I do or if I'm photographing just people! 03. How long does it take for you to edit a photo or an entire session? Horse and rider sessions can vary a lot on the type of session. There's a lot of images that I just have to throw my preset on, maybe clean up some objects in the background or minor blemishes. Sometimes there might be more advanced edits, but on an average it takes me about five minutes per image. The difference there is that I can offer up to 50-60 images in some of my larger packages. I've found that those sessions usually take me all day to finally edit and complete. 04. Are you able to make a good living off of only photography? Do you pay for your own horse that you're riding? Do you live off only your photography income? These questions were all a little bit similar so I put them together into one! The answer is pretty much yes! I'm currently supporting myself entirely on my own without any financial help from my parents whatsoever. That being said, I do not own my own home. When I am in my technical home base in Southern California I do stay with my parents so they do support me there for sure. However, 90% of the year I'm traveling and paying living expenses. I have my own car payments and insurance, student loans, and more that I all fund myself. I'm really hoping to get my own place this year, I just haven't really decided where! Being a 23 year old with no responsibilities other than myself makes affording my living a lot easier. That being said, I do spend A LOT of my money on horses. I turn a lot of my profit that doesn't go towards managing my own life into riding and showing horses. I've been funding my lease fees and showing on the A circuit for these past few months all by myself just from photography! That includes all the showing I'll be doing in WEF this year. Being able to fund my career in the horse industry is honestly one of the most important accomplishments for me. More than anywhere I travel, the money I make, or how big the company gets -- as long as it allows me to continue my passion of riding horses, it always makes me proud! 05. Do you own any horses? I do not at this time. The last horse (and consequently the only horse I've owned) was a chestnut OTTB named Cooper that I unfortunately had to sell when I went to college. Since then I've just catch ridden and leased everything for the last few years! 06. Could you do a tutorial on how you edit black backgrounds? Would you ever sell a video explaining how to shoot and edit black backgrounds? At this time, I'm really dedicating most of my teaching ability to online mentorships and workshops. The reason behind these things are very simple -- interaction! I feel like just selling or posting a tutorial online is so impersonal. The point of interacting with you guys is what makes teaching so successful! Just watching a video and not being able to ask questions is a huge negative towards the video option. I think it gives you a very black and white, cookie cutter, way of doing anything and that doesn't actually TEACH you anything. I love talking with fellow photographers, who can ask specific questions that I can answer with whatever expertise that I might have in a one-on-one environment. I would never like to sell a workshop video because the point of a workshop allows photographers to ask face-to-face questions and also experiment with their camera in a real life setting. I find that learning by doing is far more education and helpful from learning from simple reproduction of steps. An image from my last workshop in Southern California. This year I'll be hosting another workshop in Wellington, Florida! 07. How do you create the nice text and aesthetics in your stories? 08. What is your favorite breed of horse? What's your favorite color of horse? Where's your favorite place to photograph? I pretty much like any kind of warmbloods personally! To photograph I've always loved capturing the personalities and beauty of Andalusians the most. They are always stunning and photograph so well! Color wise, I'm very impartial towards chestnuts, especially ones with a lot of chrome. I've had a lot of awesome opportunities to photograph in all sort of places all over the US, but one of my most favorites places EVER is Wellington, FL during WEF. I'm not sure if it's just the horse-centric environment, beautiful horse, or barns... or maybe all of it! WEF circuit is literally just my most favorite time of year! 09. How did you come up with your business plan? How do you know how to price your services? How do you incorporate business expenses, and personal expenses into your pricing? A lot of my beginning business plans and pricing were very much part of an experiment. I mean I started off offering $25 dollar photoshoots for my friends when I first started! My prices have obviously grown from then, but that came from my confidence in my work and the products I was producing for people. I've always been very aware of my pricing and my situation to make the most of it. In the beginning I was very cheap, but I did a LOT of shoots to make up for that. Now that I've gotten to a point where I'm figuring out how much I want to work, I've raised my prices to meet that expectation. I also hired a CPA this last year to handle my taxes and deductions with business expenses and that made a HUGE difference. He helps a lot to find ways to save me money. I've been told on many an occasion that I'm too cheap for the quality that I offer and the time that I put into every image and session. I can understand that, I do feel like I work insanely hard, but I'm priced where I am for a reason. I never want to be so expensive that I alienate a different kind of equestrian. It's nice having the clients with competition horses, but I still appreciate the people with their twenty+ year old ponies living in their backyards that contact me and want pictures. There are people that have saved up money for months just to do a shoot with me because they love their horse and I love those clients just as much as everyone else. I never want to be so expensive that people that just truly love their horses can never get quality pictures and memories to last a lifetime. I don't want to forget the quiet horse girl that could barely afford to show that had this crazy idea that I wanted to be a photographer. 10. How do you feel about competition? I'm only going to assume that this meant competition between photographers and not competing in a horse show (which would be a short answer: I love it!). I think competition is important, as with any market, but it can have its downsides. The best thing about it is that I feel like it pushes all of us to be our very best. As with any industry, you aren't going to be the only one offering your craft. Very rarely are there truly original ideas anymore -- what's original is the way you offer, brand, and market those ideas. The way you represent yourself and your work to the world is what sets you apart from everyone else. The amount YOU work, the dedication YOU have, and the passion YOU preserve is what makes YOU great. Notice all the you's? The reason is simple. Your success has nothing to do what other photographer's are doing! I hear people using the excuse that their competition is ruining their business and it's just that -- an excuse! Competition does not need to be a negative thing ever. 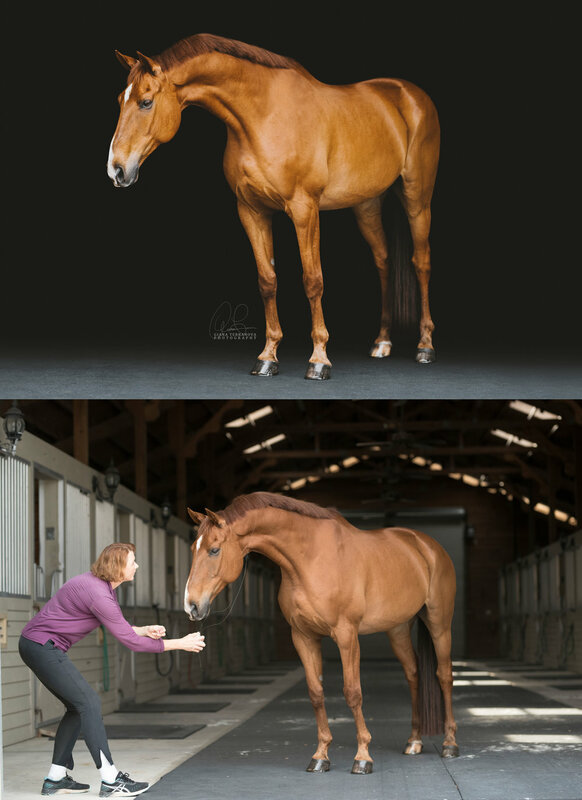 There are so many other people in this world that offer equine photography -- and that is a GOOD thing! There is now a large community of people all learning, growing, and advancing their careers and they all have amazing advice to give. We are so lucky to have this as equine photographers. There are so many people that offer advice and help to one and another and I think that's amazing. It's the main reason why I've begun offering online mentorships and going out of my way to set up workshops. -- Community always triumphs competition! So if you ever see me in the real world, please say hello! Let's get coffee, let's talk about horses and cameras and learn from each other!